1 Heat oven to 350ºF (325ºF for dark or nonstick pan). Spray bottom only of 13x9-inch pan with cooking spray, or grease with shortening. 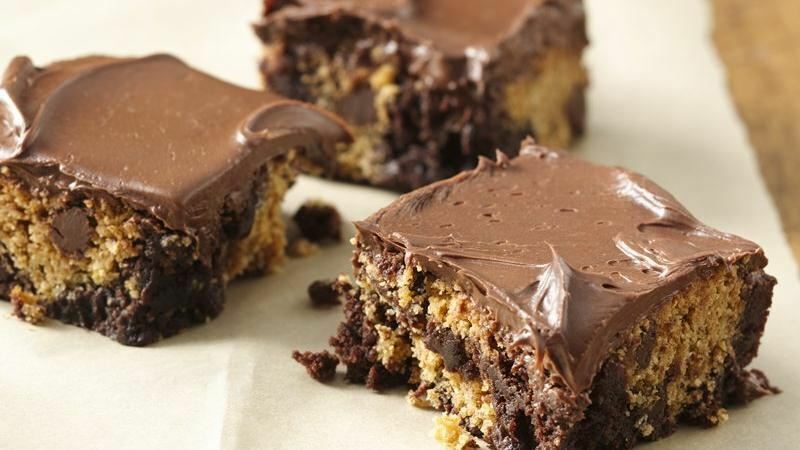 Make brownie mix as directed on box. Spread in pan. 2 Make cookie mix as directed on pouch, using butter and 1 egg. Drop dough by rounded tablespoonfuls evenly onto brownie batter; press down lightly. 3 Bake 42 to 47 minutes or until toothpick inserted 2 inches from side of pan comes out almost clean. Cool on cooling rack 30 minutes. Frost with frosting. For brownies, cut into 7 rows by 6 rows. 1 Heat oven to 400°F. Lightly grease cookie sheet with shortening or cooking spray. In large bowl, mix flour, sugar, baking powder and salt. Cut in butter, using pastry blender (or pulling 2 table knives through ingredients in opposite directions), until mixture looks like fine crumbs. 2 Reserve 2 tablespoons apricots for topping. Stir remaining apricots and 1/3 cup vanilla baking chips into crumbly mixture. Stir in egg and just enough half-and-half so dough leaves side of bowl and forms a ball. 3 On lightly floured surface, knead dough lightly 10 times. Pat or roll into 8-inch round on cookie sheet. Cut into 8 wedges, but do not separate. 4 Bake 14 to 16 minutes or until golden brown. Immediately remove from cookie sheet; carefully separate wedges. 5 Place melted baking chips in small resealable food-storage plastic bag; seal bag. Cut off small corner of bag; pipe small amount of melted chips over scones. 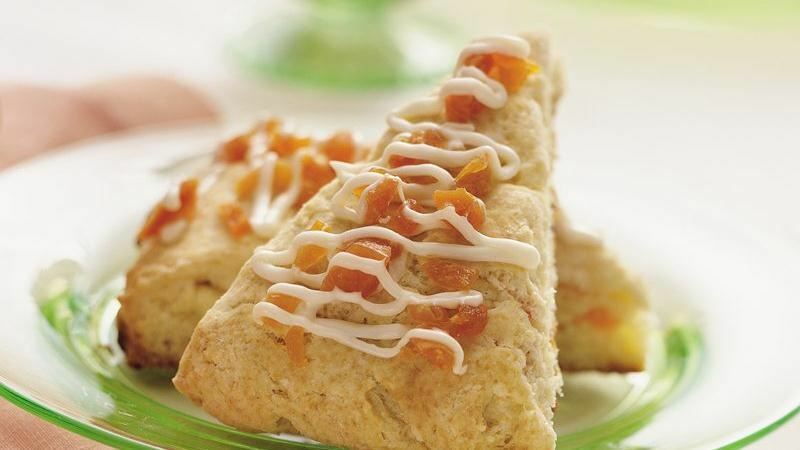 Sprinkle with reserved 2 tablespoons apricots. Pipe remaining melted chips over scones. Serve warm or cool. 1 Heat oven to 375°F. 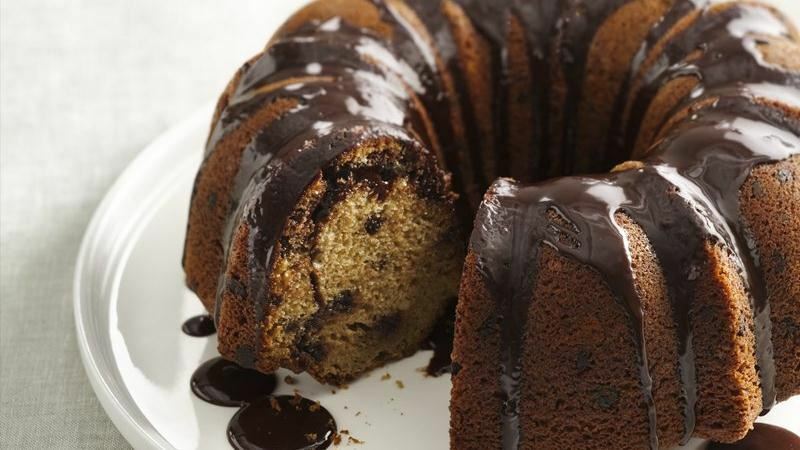 Generously grease 12-cup fluted tube cake pan. 2 In 2-quart saucepan, cook all filling ingredients over medium-low heat 2 to 3 minutes, stirring constantly, until smooth. Remove 1/3 cup filling for glaze; set aside. Freeze remaining filling 15 minutes until thick like pudding. 3 Meanwhile, in large bowl, stir together all cake ingredients. Spoon half the batter into pan. Remove filling from freezer. Carefully spoon filling in center of batter to within 1/2 inch of pan edges. Spoon remaining batter over filling. 4 Bake 50 to 65 minutes or until top springs back when touched. Cool 15 minutes. Remove from pan to wire rack. Spoon reserved 1/3 cup filling on cake to glaze. (If too thick, microwave filling on High 10 to 15 seconds using microwavable small bowl.) Cool completely, about 1 hour.